Transforming your organization into a digital business is hard work. Eliminate silos, simplify operations and extend your investment in Microsoft Hyper-V virtual machines (VMs) with Cohesity. Extend the benefits of Cohesity’s modern, streamlined snapshot approach to backup and recovery for Microsoft Hyper-V 2012 R2 and Hyper-V 2016 environments. Use Cohesity and Microsoft native APIs to transform your data center from silos of dark data into efficient, web-scale data management infrastructure. Deliver sub-5 minute RPO and instant mass restores to keep up with your growing business. 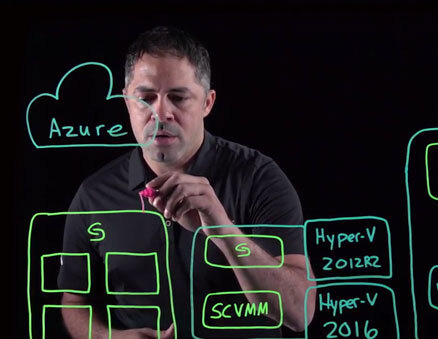 Enable fast, secure, and native backup and recovery of Microsoft VMs through Cohesity. Cohesity integrates with Hyper-V System Center Virtual Machine Manager to automatically discover and protect all Hyper-V VMs, allowing users to easily meet their business SLAs. Enable resilient change block tracking (RCBT) across all subsystems and inventoried properties to know when blocks are changed using VSS and Cohesity’s ephemeral agent as a helper. Leverage Cohesity and Microsoft native APIs to handle any communications between subsystems that are part of the architecture, such as between a Hyper-V host and any System Center VMs. Improve operational efficiency by reducing backup windows and achieving instant recovery from anywhere. Less work and less data footprint. Minimize backup windows by parallelizing jobs. Leverage app integration with agentless, app-consistent backups for Hyper-V. Protect data off-site and enable disaster recovery (DR) and migrations to remote sites, with built-in remote replication. Reduce your data footprint with global deduplication across multiple workloads throughout the cluster. Take advantage of Cohesity's Google-like, wildcard search to quickly search and recover VMs--in the cloud or on-premises. Use Cohesity’s native cloud integration to seamlessly move, protect and leverage the data in the cloud. Replicate, tier and archive to Microsoft Azure. Provision test/dev in the cloud and gain visibility into your data, on-prem and in the cloud. Take advantage of long-term archival, tiering, and replication capabilities in Cohesity thanks to tight integration with Microsoft Azure as well as all other leading public clouds. Use Cohesity’s native-cloud integration to backup, recover, and accelerate application development of HyperV VMs by provisioning test/dev environments in the cloud. When ready, move them back again. Cohesity treats hypervisors as just another service to be backed up. This means that the administrative experience remains largely the same whether you’re backing up SQL Server, VMware or Hyper-V.
Other solutions advertised ‘enterprise quality’ but had an enterprise price tag. Cohesity not only could deliver what other enterprise solutions promised, but was also able to out-perform and deliver a software-defined secondary data management solution that has saved us countless hours for upgrades, maintenance and basic restore operations.